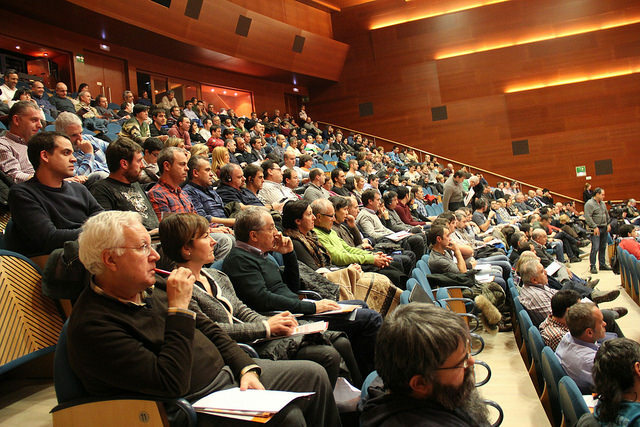 The Mondragon Corporation, the federal body of the autonomous cooperatives in the Mondragon family, held its annual congress last week in the Basque city of Donostia (San Sebastián). The federation’s President Javier Sotil gave an upbeat account of Mondragon’s progress, reporting that in 2015 the group had created 1,300 new posts. A new coop, engaged in the delivery of residential services, joined the federation. The most interesting part of the event for those of us outside looking in was the discussion of the progress of Mondragon’s strategic review, launched after the failure of the white goods cooperative Fagor Electrodomésticos in 2013, a very painful experience for the cooperative group. The review, entitled Mondragon of the Future, was first discussed at the 2014 congress. As far as I’m aware documents are not yet public, but Mondragon has had task groups working on developing proposals in three areas and their proposals are now being discussed at individual cooperative level. The first issue being addressed relates to Mondragon’s cooperative values and principles, with the aim of reinforcing them and encouraging a culture of ‘self-reliance and responsibility, solidarity, social transformation and cooperation between cooperatives’. The second is concerned with Mondragon’s organizational structure and on ways in which the various Mondragon coops can improve their competitive trading position. The third part of the strategy looks at the way that the financial framework behind the Mondragon federation can be structured – or in other words how much the cooperatives themselves contribute to the central pot. “We are now in the phase of consulting with the cooperatives. After that, with the feedback received, we will draw up the final reports, to be delivered, debated and agreed at the 2016 Congress,” Javier Sotil told the 650 delegates. Congress next year may be held during the Summer, he added. Work Together, the e-newsletter published by CICOPA (the international federation of workers’ and producer cooperatives), is always worth a look and the latest edition arrives in my inbox this morning. Among other stories there’s one about the Mondragon Corporation’s moves to discuss how the cooperative federation should in future combine autonomy and self-management for its individual constituent cooperatives with federation-wide solidarity between the coops. This is an important discussion, one which has relevance outside the particular context of Mondragon. On close reading, CICOPA’s story is simply a report of the Mondragon conference last December which I covered myself in a blog here on Dec 17th. But it has reminded me that I need to continue to monitor the discussions at Mondragon. I’ll let you know here as and when I find out more. The annual Congress of the Mondragon family of cooperative businesses took place on Monday this week in San Sebastián – or, to give it its proper Basque name as we should, Donostia. 650 delegates were there, from across the whole range of cooperatives, to hear the incoming General Council president Javier Sotil call for Mondragon to reinforce its commitment to cooperative values but also to focus on running profitable and sustainable businesses. Introducing “The Mondragon of the future”, Sotil stressed the need to be both a ‘cooperative enterprise’ and a ‘competitive enterprise’, operating successfully throughout the world. The need he said is for strong solidarity mechanisms between Mondragon companies and better early-warning of trading difficulties. “The Mondragon of the future” strategic document now goes to member cooperatives for further discussion, before being discussed again at the 2015 Congress. Since I covered the news last Autumn of the business failure of Mondragon’s federated cooperative Fagor Electrodomésticos, I should probably give you an update – not least because of Mondragon’s iconic status in the coop world. About 1000-1200 employees of Electrodomésticos were members of the cooperative, and the rest of the Mondragon family of coops is now trying to do what it can to find work for them elsewhere in the group, or to help provide them with favourable terms for early retirement. According to the international producer coop federation Cicopa, a total of 417 ex-members of Electrodomésticos are now re-employed in other coops in the group. Electrodomésticos’s bankruptcy is the biggest test which Mondragon has had to face, but – contrary to what some media comments have suggested – it represents the failure of one particular business entity, and not the whole Mondragon initiative. A major cooperative in the Mondragón family of cooperatives, Fagor Electrodomésticos, collapsed into receivership yesterday with debts of around 850m Euros. Fagor Electrodomésticos made ‘white goods’ (things like washing machines, fridges and ovens) in factories in the Basque country, in France, Poland and in several other countries worldwide. The cooperative is autonomous but is federated in the Mondragón group (which includes well over 100 other cooperatives, together employing 80,000 people). The General Council of Mondragón, which is one of the most important European producer cooperative federations, decided at the end of last month that it could no longer continue to support Fagor Electrodomésticos financially. The group will however attempt to protect the 1000-1200 employees who were cooperative members. I have written over the past 24 hours on Fagor for both Co-operative News and The Guardian, and will include links here when my stories are published.